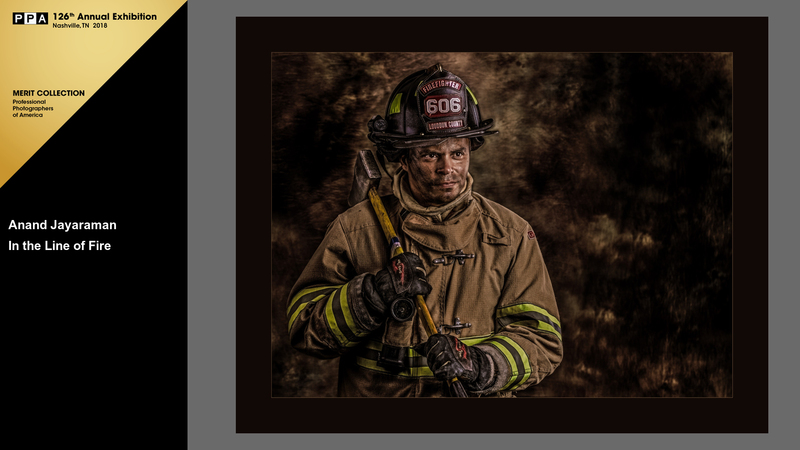 As I was thinking of ideas to create portrait images for my competition, I asked our friend and local volunteer fire fighter "Rolando" if he could show up at AJ Photoz Studio with his firefighting gear. He was beyond thrilled in collaborating with us. Not only did he show up with his gear, he can up with great emotions in creating this image. The first few shots were great, but they turned dramatic when Rolando added some dirt to his face and started interacting with my wife, living a real situation and listening to his team leader's instructions. The next thing I knew was I had my "competition" image. The image was further enhanced in Photoshop by dodging (lightening) and burning (darkening) areas to bring in interest to the subject. The image was originally submitted to the South East Professional Photographic Association (SEPPA) judging in March, where is got a seal of Approval for a score of 86. The image was accepted in to the "Merit Collection" at the International Photographic Competition in July 2017. Shot with Canon 5D Mark IV, Canon 70-200 f2.8 @ f11/160, using Alien bees for lights. The image was created at our studio with a printed backdrop, we used a 3feet x 4 feet soft box to the subjects left as a main light, an umbrella right by the camera as a fill light and a rim light to light him from behind. Read this to learn more about the competition and the judging process.